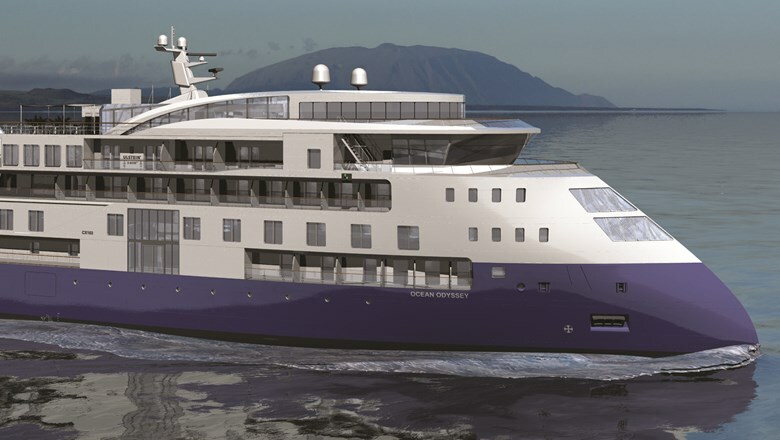 River cruise operator Vantage Deluxe World Travel plans to build two small ocean expedition ships, with the first one scheduled for service in March 2021. Boston-based Vantage has largely employed a direct-to-consumer sales model since its founding in 1983, but said it plans to market and sell ocean cruises through travel agents. The futuristic Ocean Explorer will be outfitted with 77 cabins, giving it a capacity of 154 at double occupancy. Vantage said the ship will accommodate 170 guests. Vantage said 20 itineraries planned in the first year include sailings in Asia and Europe, a transatlantic passage to North America, followed by voyages to Central and South America and Antarctica. Vantage said the ship will provide “true synergy between luxury travel and expedition cruising.” Vantage said the ship’s activities will include small-group wildlife viewing, biking, kayaking and paddle-boarding. The design of the ship will feature the backward-slanting bow increasingly used by cruise lines, especially for smaller expedition ships. A rendering shows a vessel with a blue and white hull, several glassy observation areas towards the bow and plenty of balcony cabins. A sister ship, the Ocean Odyssey, is scheduled for 2022. Vantage sails river cruises on the Rhine, Danube, Main, Moselle and Seine rivers. The company also charters ships in Portugal, the Mediterranean, Russia, Asia, North America, Central America, and South America.